Protein drugs form a highly segmented and promising market. They have many advantages over small-molecule drugs: Their actions are highly specific, they are less likely to interfere with normal biological processes, and they are often well tolerated. Protein drugs have gained importance for their therapeutic applications, and the numbers of such products have increased in recent years. In a new study, BCC Research finds that methods such as recombinant DNA technology and genetic engineering have elevated the market for protein drugs to new heights. 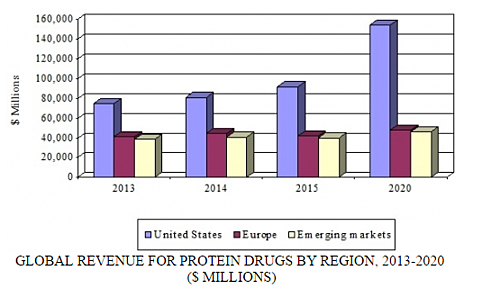 The global market for protein drugs reached $174.7 billion in 2015 and should approach $248.7 billion by 2020, reflecting a five-year compound annual growth rate (CAGR) of 7.3%. By region, the United States is the largest market, reaching nearly $92 billion in 2015. This is also the fastest-growing region; with a projected five-year CAGR of 10.9%, the US market should total $154.1 billion by 2020. Europe, with a market value of $42.2 billion in 2015, is expected to attain $48.1 billion by 2020, reflecting a five-year CAGR of 2.6%. In the war on cancer, normal cells are often unintended casualties. Any ability to seek and destroy cancer cells, while sparing healthy tissue, is laudable. Two recent studies that use engineered proteins are nicely illustrative of this effort. CAR T-cell therapy can now specifically target solid tumors. In one study, published in the journal Immunity, researchers from the University of Pennsylvania genetically engineered cells to produce a protein that recognizes a glycopeptide found on cancer but not normal cells. Chimeric antigen receptors (CARs) have been successfully used for treating blood cancers. However, the full potential of CARs for treatment of solid tumors has been limited by side effects to normal tissues that contain the protein targeted by the engineered cells. The researchers describe how an antibody that recognizes the combination of a known cancer-associated surface protein and a cancer-associated carbohydrate can be applied as a CAR-based T-cell therapy for a wide range of solid tumors. The researchers genetically engineered human T cells to produce a CAR protein and then demonstrated its effectiveness in mouse models of leukemia and pancreatic cancer. "This is the first approach, using a patient's own immune cells, that can specifically target this class of cancer-specific glycoantigens, and this has the great advantage of applicability to a broad range of cancers," said one of the study’s authors, Avery Posey, PhD. "These engineered cells will be able to increase cancer specificity of this immunotherapy and decrease the potential for toxicity in patients." The novel CAR T cells developed by Posey and his colleagues express a monoclonal antibody called 5E5. This antibody specifically recognizes truncated carbohydrate molecules on the mucin 1 (MUC1) protein that are absent on normal cells but abundant specifically on cancer cells. The 5E5 antibody recognized multiple types of cancer cells, including leukemia, ovarian, breast, and pancreatic cancer cells, but not normal tissues. When these CAR T cells were injected into mice with leukemia or pancreatic cancer, the tumors shrank and were even eliminated in most animals, resulting in increased survival. Importantly, the CAR T cells could not damage normal human cells or cells without the abnormal carbohydrate. High-powered microscopy demonstrated that normal cells express the immature, cancer-related version of the MUC1 protein only inside the cell, whereas cancer cells shuttle the abnormal protein to the cell surface, showing why these CAR T cells can only recognize the cancer-specific protein on tumors. "Future cancer immunotherapies combining the targeting of cancer-specific carbohydrates and cancer proteins may lead to the development of incredibly effective and safe new therapies for patients,” said Posey. Armed proteins deployed for hard-to-reach cancers. Latching chemotherapy drugs to engineered proteins that seek out tumors could provide a new way of treating tumors that are hard to reach with traditional chemotherapy, such as those in the brain or with limited blood supply. In recently published work, researchers used an engineered protein rather than an antibody to direct the drug to the tumor. Although the two techniques are conceptually similar, the specialized protein has the potential advantage of being able to pass through the blood–brain barrier, which would enable it to be used for treatment of brain tumors. It is also smaller than an antibody and thus might be able to reach dense tumors with little blood supply. “Antibodies can be limited for treating solid tumors because they are too big to penetrate well,” Stanford Medicine’s Jennifer Cochran said in a statement. “The idea is that a smaller molecule could diffuse into the tumor better.” Cancer cells often produce surface molecules known as integrins. The goal of Cochran’s team was to create an engineered protein that could bind tightly to those integrins and be used as a drug delivery vehicle. Beginning with a protein called knottin, Cochran used directed evolution to engineer a protein variant that would bind strongly to the integrins. The researchers then worked out two strategies for attaching chemotherapeutic drugs to the evolved knottin. One strategy used a portion of an antibody to connect the drug to the knottin. This approach mimicked antibody therapies that are already on the market, thus perhaps speeding the time it would take to get the therapy approved for patients. In mice with implanted human tumors, the knottin successfully delivered the drug to the tumor and killed the cancer cells. A second approach used a small chemical link to attach a chemotherapeutic drug directly to the knottin. The knottin–drug combination effectively killed breast, ovarian, and pancreatic cancer cells in a lab dish. The targeted drug delivery was highly effective against cancer cells, including those that had developed a resistance to the drug alone. Global Markets and Manufacturing Technologies for Protein Drugs examines the industry by each major class of protein: therapeutic monoclonal antibodies, cytokines, peptide hormones, vaccines, and blood products. New technologies, growing competition, and changing customer needs are also discussed. Analyses of global market drivers and trends, with data from 2014, estimates for 2015, and projections of CAGRs through 2020, are provided.